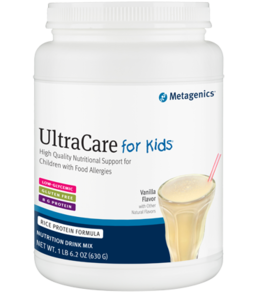 Metagenics - Ultracare for Kids - 1 Lb. 6.2 Oz. Ultracare for Kids medical food is specifically formulated for children with atopic disorders such as eczema, rhinitis, and allergy-responsive asthma. Features low-allergy-potential rice protein for children with dairy, egg, gluten, corn protein, or soy protein sensitivities. Provides non-dairy calcium-250 mg per serving. When combined with the accompanying diet plan, provides high quality nutrition for children with food sensitivities. Comes with a detailed Parent Guide explaining product use, a suggested food and snack list with sample menus for elimination diet programs, and a diary for recording diet and symptoms. Available in delicious Vanilla flavor. Blend, shake, or briskly stir one scoop (30 g) of Ultracare for Kids into 8 to 10 ounces of pure, distilled, or filtered water until powder is completely dissolved. If advised by your healthcare practitioner, use diluted fruit or vegetable juices according to the directions in the Parent Guide. Store canister in a cool, dry place. Saturated fat is contributed by olive oil. In order to ensure proper use of our high-quality nutritional supplements, Metagenics only sells to licensed healthcare practitioners. The products listed in this online catalog are available in the United States and may not be available in other countries. In addition, certain formulas may be slightly different outside the US.